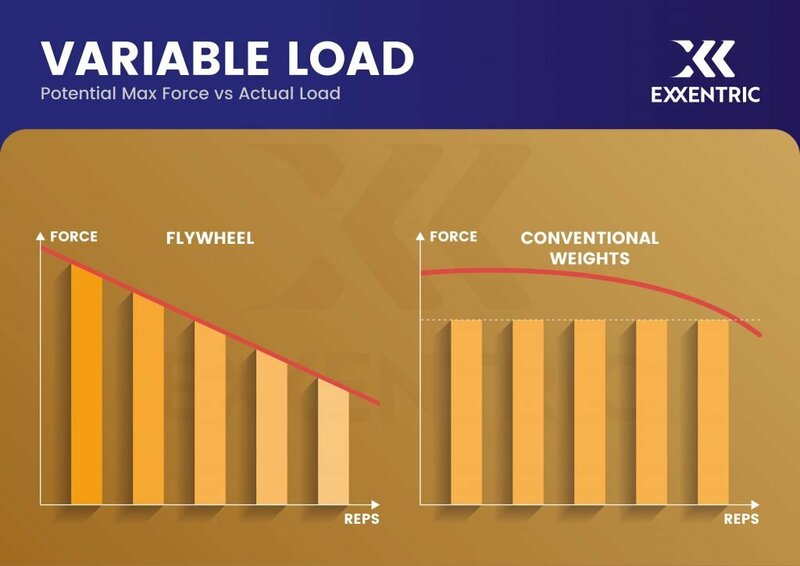 Flywheel training on the kBox offers many advantages over traditional strength training, of which the variable resistance may be the most important. There is no upper limit to how much kinetic energy you can generate with flywheel training. This means that you can always use a higher force and accelerate the flywheel more. Resistance is variable such that if you pull less, the flywheel will resist less. Therefore, the kBox is suitable for all types of resistance training, from heavy strength training to rehabilitation, as well as for subjects from elite athletes to elderly or even sedentary individuals. With traditional weights, only the last repetition is maximal if you continue until failure and all reps prior to that are submaximal. In flywheel training, if you go maximal then every repetition can be maximal, with a higher force and power output early in the set and lower in the end. Another key benefit of the variable resistance of flywheel training is the possibility to control the level of resistance throughout the repetition. With regular weights, the momentum on your joints will depend on where the weight is and the direction of its motion relative to gravity. If you can’t pass a sticking point, you have to use a lower weight or cheat by, for example, changing the angle even if you can move that weight in other ranges of your range of motion. Likewise, if your strength is lower in one part of your range of motion, you will need to adapt the weight even if you are strong in another part. With flywheel training, you are not limited by these factors, and hence you can work out maximally all through your range of motion regardless of your sticking point, and you can easily do submaximal work in one range and maximal in another. The variable resistance will also have effects on your training results. Studies of flywheel exercises have shown increases in all portions of the quad muscle, more total gains of strength and mass, and more strength over the whole range of motion. With traditional weight stack devices in comparison, the gains are more focused on the sticking point. Proceed to learn more about our courses and equipment, or go back to the physiological advantages of flywheel training.